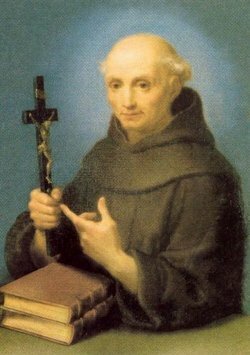 Saint Thomas’s brief biography may be read here. Praise to the holy woman whose home is built on faithful love and whose pathway leads to God. 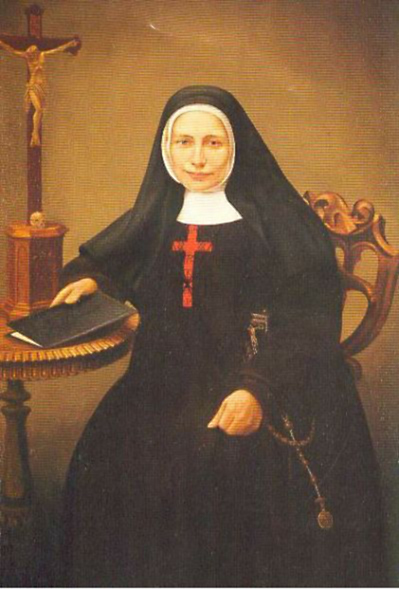 Almighty God, You caused blessed Angela to excel in contemplating the mysteries of Your Son. Through he merits and prayers may we share in the same mysteries on earth and rejoice exultantly in the revelation of Your glory. 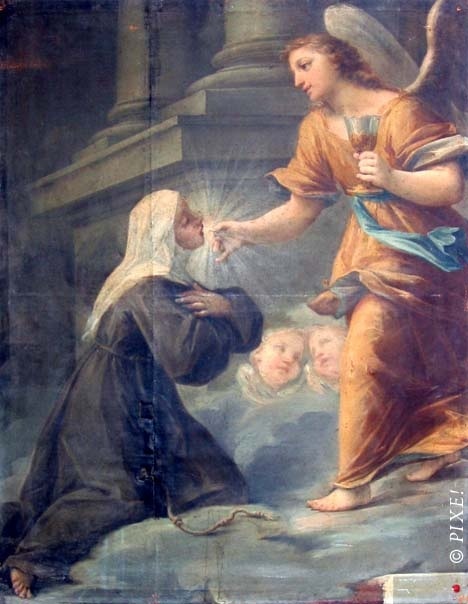 A 13th century third order Franciscan, Blessed Angela, gave her life to Christ based on a vision she had had of Saint Francis and after living a wild, and some would say sinful life. 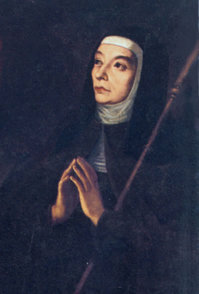 She was a wife, mother and a leader of other lay people who followed the Franciscan Rule for the laity. Blessed Angela is the patron against sexual temptation, against the death of children, people ridiculed for their piety and widows. She is often depicted receiving Holy Communion from the Lord, or in the case of the image here, from an angel of the Lord (given her name, “Angela”). The observance of the feast has had a number of changes: some calendars note her feast day as January 4th or March 30th, but the current Ordo has her liturgical memorial listed today. the brethren with all care. A little bit on Blessed Mary Frances’ life is found here and about her order you can this entry. Some groups and webpages have Blessed Mary Frances’ liturgical memorial on December 15. The Roman Martyrology lists her on December 14 and the Franciscan supplement to the Roman Missal indicates today. Come you who have my Father’s blessing. Inherit the kingdom prepared for you from the creation of the world. O God, grateful towards those who invoke You, You gave the virgin, blessed Mary Angela, the grace to penetrate the secrets of Your richness through her daily office of praise. Grant that we, through her intercession, may direct all our actions toward You, that they be in praise of Your glory. As a fruitful olive tree in the house of God I have hoped in the mercy of God for ever and ever. God our Father, You made Saint James an illustrious preacher of the gospel for the salvation of souls and for bringing sinners back to the path of virtue. Through his intercession grant us the grace to atone for all our sins and to attain to everlasting life.